Intorductory Price! Brand New Book! An historical account of the rise and demise of the LV&T (1905-1919) and its service to the gold and silver mining districts of southern Nevada, including Tonopah, Goldfield, Bullfrog and Rhyolite. At the helm was Montana Copper King and SP,LA&SL RR (Salt Lake Route) head and one-time Senator, William Andrews Clark, and brother James Ross. William was key to the establishment of Las Vegas and namesake for Clark County, NV and Clarkdale, AZ. 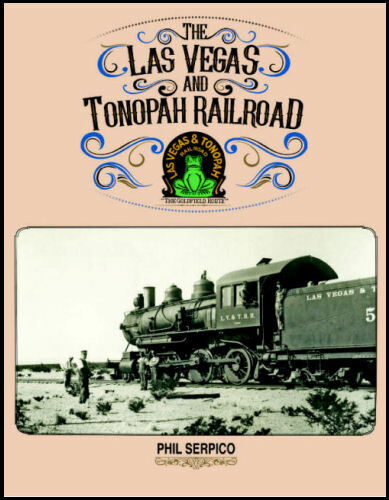 Includes related material on Las Vegas Ranch, Las Vegas Land & Water Co., as well as the Tonopah & Goldfield (w/ Virginia & Truckee and Carson & Colorado RR connections), Bullfrog Goldfield and Tonopah & Tidewater railroads. Contains nearly 225 black & white photos and illustrations, including timetables and maps; 40 color images of artifacts, ephemera and maps. Also, comprehensive locomotive, rolling stock and station name material. 8.5”x11” color laminated. Hard cover.